As we re-read Max Weber, we might recall that it was on this date in 1545 that Renaissance writer, physician, humanist, monk, and Greek scholar François Rabelais received the permission of King François I to publish the Gargantua series– Gargantua and Pantagruel as we know it. 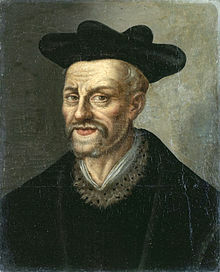 In fact, Rabelais’ wild mix of fantasy, satire, the grotesque, bawdy jokes, and songs had been circulating pseudonymously for years. The censors of the Collège de la Sorbonne stigmatized it as obscene; and in a social climate of increasing religious oppression in a lead up to the French Wars of Religion, it had been treated with suspicion. Rabelais wrote at a time of great ferment in the French language, and contributed mightily to it– both in coinage and in usage. But his influence was even broader (Tristram Shandy, e.g., is full of quotes from Rabelais) and continues to this day via writers including Milan Kundera, Robertson Davies, and Kenzaburō Ōe.